Saturday the three of us went to Home Depot to one of their "how to" clinics.........it's actually the one that they invented on The Apprentice. 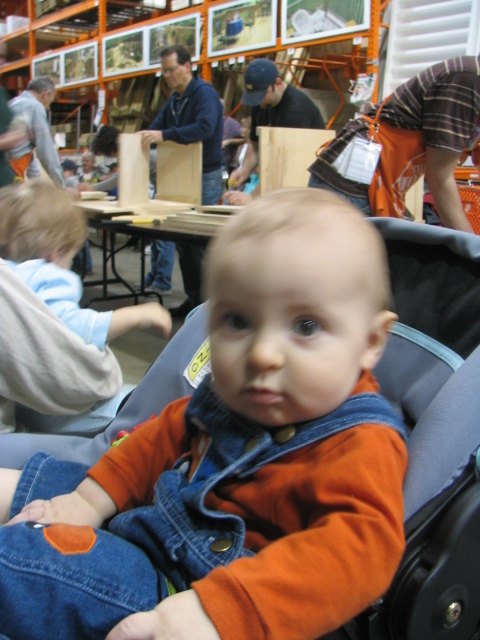 One of the projects of the teams was to invent a "How to" clinic for Home Depot. Home Depot execs judged and liked it so much they decided to have the clinic offered at their stores nationwide. Click here to get a recap of that episode. Dennis got to make a storage chest, that we're going to use for a toy box. We bought stuff to make the top/lid into a chalkboard and we'll paint it white and green like Hayden's bedroom. The "Box" is completely finished!! !